A Russian soldier patrols a carriage on a Moscow subway train at the Lubyanka metro station. Moscow, Russia (CNN) -- Three men involved in the Moscow subway bombings in March were killed when they fought back during an attempt to arrest them, the director of the Federal Security Service told the Russian president Thursday. The officials' meeting was shown on Russian state television. 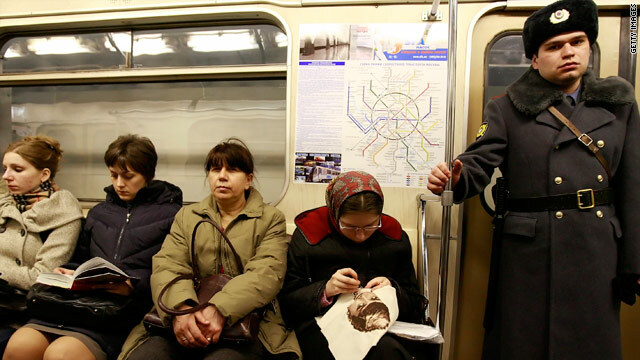 One of the three killed had accompanied the two female suicide bombers from Dagestan to Moscow and guided one of them to the subway, Alexander Bortnikov told President Dmitry Medvedev. "They offered a bitter armed resistance and were eliminated," Bortnikov said. "Active measures have been taken to hunt down the other members of the gang." The twin bombings struck the Moscow metro during morning rush hour March 29, killing 40 people and wounding more than 80. Alexander Bastrykin, the head of the Investigation Committee of the Russian Prosecutor-General's Office, said investigators are trying to pursue the organizers of the twin bombings. "There are grounds to believe that jointly (with the Federal Security Service) we will be able to find out who specifically organized those terrorist acts in the Moscow subway," Bastrykin told Medvedev at the meeting. Medvedev ordered the investigation to continue, adding, "Those of them who offer resistance should be eliminated. We shouldn't spare them." Maryam Sharipova and another female bomber, Dzhennet Abdullayeva, detonated their explosives about 40 minutes apart on the day of the bombings. The blasts ripped through the Lubyanka and Park Kultury stations in central Moscow while an estimated 500,000 people were using the subway system. CNN's Max Tkachenko contributed to this report.